Mr. Tej & His Team of High Mountain Wave Trekking have been most helpful & provided a great inside in to what Nepal has to offer. This park is the most popular destination for tourist wanting to have a good experience of the regions wildlife. It was declared a national park in 1973. In 1984, UNESCO designated it as Natural World Heritage Site. The park offers protection to 56 species of mammals including the one horned rhinoceros, Bengal Tiger, leopard, sloth bear, wild elephant, striped hyena, Gangetic dolphin and wild bison. There are an estimated species of birds, 126 species of fish, 590 species of butterflies and 47 species of reptiles in the park. 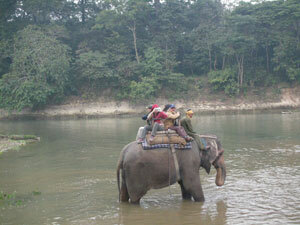 A recent study also points out the over a third of Nepal's total population is in Chitwan. This package is ideal for those who wish to take an adventure in the forest at an affordable price, but in an executive way. You will be among One-Horned Rhinoceroses all the time and deer roams your cottage from the dawn of the day. It is likely that you'll encounter Tiger while you go deep into the forest on the elephant back. On reaching resort, our Guest Relations Officer will brief guests. 9:00 am - Crocodile Walk. A 45 minute walk through grassland and forest. Board boats to observe crocodiles along the banks while floating back to the camp. Day 01: Arrive, meet & transfer to our Camp. 9:30 am - Boat Excursion a full day Nature Trek to the inside of the national park. Pack lunch en route & return by drive. 9:30 am - Visit Tharu Village to see and learn about the ethnic people of Chitwan. Return to camp. All Transportation during Chitawan Natinal park pacakge destinations will be provided in a private vehicle. All accommodation in Chitwan National Park including all program activities, Elephent Safari, Jungle walk, Tharu village visit, Local village Sightseeing, accommodation at Camp resort, 3-meals per day and all park entry permits. Personal expenses such as laundry, telephone calls, alcoholic beverages, bottled drinks (including cold drinks and mineral water), tips. Binoculars, Flashlight, Insect repellent, A jacket or sweater from November through February. Lightest clothing with sunglasses and hats from April onwards. Pants should be worn during elephant rides. Bright colors such as red and white should be avoided since those colors have been known to upset the rhinos. Comfortable walking shoes are essential. Please carry only the bare necessities but not jewellery and valuable items. During the warmer months swimming suits are recommended.